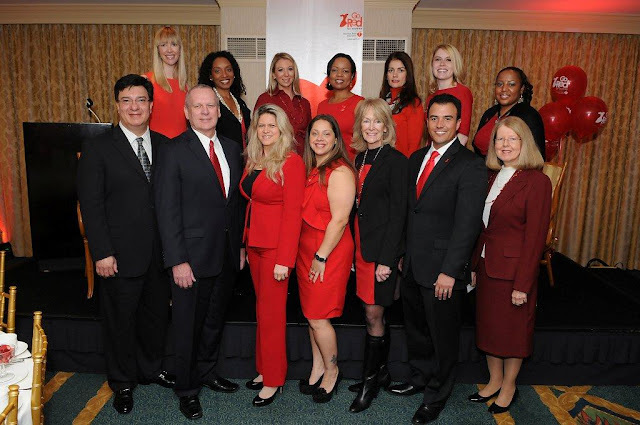 I have attached some photos from National Go Red Day, February 1st. 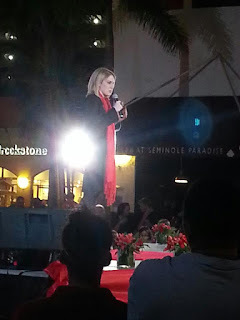 That week was quite busy to say the least...but I was so happy to meet such wonderful, influential people, and also to spread the word about women's heart disease and health. Being that we are still in heart month, I wanted to have a heart-healthy post! A lot of times I get asked for my favorite heart-healthy foods or recipes, so I thought that this would be a great time! I have included a list of my favorite heart healthy foods along with a few of my favorite recipes...ENJOY! Macy's Go Red for Women. Macy's is a national Go Red for Women sponsor! My husband picking from the trail mix! 1. Hummus! I even order this when I go out to dinner because every restaurant has such different variations. Enjoy with fresh raw veggies for an even more heart healthy snack. 4. Celery and low-fat peanut butter. Remember the ants on a log? Well, that but minus the ants. (I'm not a raisin fan). 5.Guacamole. I LOVE guacamole. For me, I have to watch my portions...I could eat the entire bowl. I have to have fresh guac though...not the kind you buy in a container. Yes, avocados have a lot of fat, but it is the good fat, and they are packed with vitamins, fiber and folate...so every once in a while, it is completely okay to enjoy this yummy green goodness. 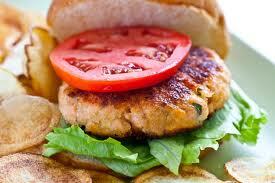 #1...Salmon Burgers. Stop making that ugly "yucky" face! I PROMISE you..these are AMAZING! My husband is not even a big fan of salmon and asks me to make these all the time! SO GOOD!!!! If you finely grind part of the salmon, it will bind the rest, which can be coarsely chopped to retain its moisture during cooking. The two-step grinding process means that those flavorings that you want minced fine, like garlic or ginger, can go in with the first batch of salmon; those that should be left coarse, like onion or fresh herbs, can go in with the rest. 1. Cut the salmon into large chunks, and put about a quarter of it into the container of a food processor, along with the mustard. Turn the machine on, and let it run -- stopping to scrape down the sides if necessary -- until the mixture becomes pasty. 2. Add the shallots and the remaining salmon, and pulse the machine on and off until the fish is chopped and well combined with the puree. No piece should be larger than a quarter inch or so; be careful not make the mixture too fine. 4. Place the olive oil in a 12-inch nonstick skillet, and turn the heat to medium-high. When the butter foam subsides or the oil is hot, cook the burgers for 2 to 3 minutes a side, turning once. Alternatively, you can grill them: let them firm up on the first side, grilling about 4 minutes, before turning over and finishing for just another minute or two. To check for doneness, make a small cut and peek inside. Be careful not to overcook. Serve on a bed of greens or on buns or by themselves, with lemon wedges and Tabasco or tartar sauce or any dressing you like. 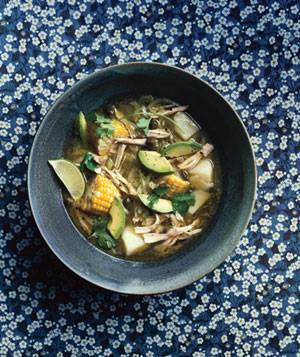 #2 Columbian Chicken Soup. I am a BIG soup fan. The only problem is that many soups are loaded with salt. Not this one!! So yummy. I thank my husband's 1/2 Columbian roots for this one. In a large saucepan or Dutch oven, combine the chicken broth and 1 cup water and bring to a boil. Add the chicken and corn and simmer until the chicken is cooked through, 10 to 12 minutes. Remove the chicken and corn from the saucepan and reserve. Strain the cooking liquid into a large bowl or measuring cup and reserve. Wipe out the saucepan and heat the oil over medium heat. Add the onion, celery, and garlic and cook, stirring occasionally, until beginning to soften, 2 to 3 minutes. Add the potatoes and the reserved cooking liquid and bring to a boil. Reduce heat and simmer until the pota-toes are cooked through, 15 to 20 minutes. #3 White Bean and Turkey Chili. A cousin of mine made a variation of this last week and it was so good! Heart healthy and yummy is a good thing! Heat a large heavy bottomed pot over medium flame. When hot, spray oil. Add onions, garlic, saute about 5 min. Add meat and cook, breaking it up until white, about 5 minutes. Add salt, chili powder, cumin, oregano, red pepper flakes and cook for 2 minutes. Add beans, broth, cook uncovered about 10 minutes. Lower heat and cover, simmer about 45 minutes mixing occasionally. Add sour cream and cook 5 more minutes. Adjust seasoning and salt to taste. Top with chopped red onion, chopped fresh cilantro, light sour cream, jalapeños and reduced fat cheddar if desired. Please let me know if you try any of these...! !